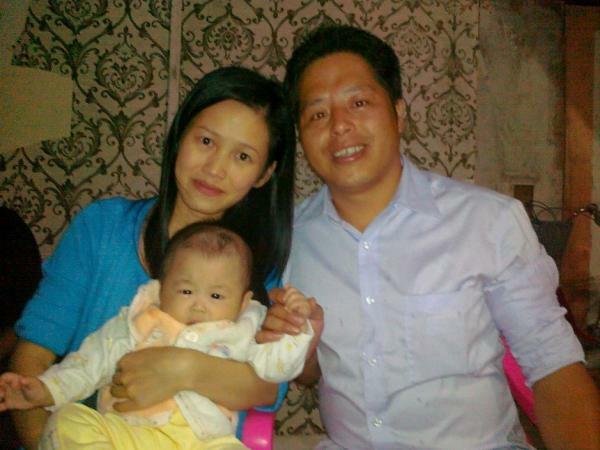 Zhuang Liehong with his wife, Little Yan, and one of his sons, Kaizhi, in 2013 — a year before immigrating to the United States. Zhuang Liehong is one of many Chinese immigrants who's made his home in the Flushing neighborhood of Queens, N.Y. Zhuang came to the U.S. seeking asylum from his village in China. As much as Flushing felt like China, Zhuang says there are some things that make it clear it's not China. "Here in Flushing, there are signs for the Democratic Party. On street corners, there are supporters with brochures," Zhuang says. "There are also Christian people doing outreach in the streets. All of this doesn't exist in China. It's not possible." In 2014, Zhuang fled Wukan just as the Chinese government was cracking down on protests there. The people of Wukan were demonstrating against government officials for selling communal land to developers. People close to him were hauled away to prison. He also says one of his friends died under police custody. Zhuang knew he needed to leave China, and he set his sights — as many immigrants do — on New York City. He and his wife, Little Yan, devised a plan to sneak into the country as part of a tour group. Once the tour group got to the U.S., the couple quietly broke away and hopped a flight to New York. At the time Zhuang knew only one person in New York: Lauren Hilgers, a journalist who had visited Wukan to report on the uprisings. Hilgers is the author of the new book Patriot Number One: American Dreams in Chinatown, in which Zhuang is the central character. "As soon as he got to my house he was very intent on getting to Flushing and starting a life, and — he had all of these goals," Hilgers says. "He wasn't going to stay at my house forever." Hilgers was right; today Zhuang has a place of his own in Flushing. Though it's on a middle-class, suburban-looking street — manicured front lawns, leafy sidewalks, driveways — Zhuang's family home is a bit less idyllic. He, his wife and their two young sons are crammed into a basement, sleeping together in one small bedroom. They share a bathroom and a tiny kitchen with two other people, who also rent space down there. There's scarcely room to move around, but Zhuang insists on certain dignities when people visit, like brewing tea. "We have this traditional virtue of becoming friends through drinking tea," he says. "So whenever a friend arrives, you have to make tea for them." Zhuang came to the U.S. for political reasons more than economic ones, and he says that he wasn't hoping to be given "preferential treatment" when he got here. "I only wanted to escape the possibility of being persecuted in China," he says. "The pressure in Wukan was that at any moment you could be arrested, at any moment you could be convicted, grabbed and thrown into prison. How long you would be locked up, you wouldn't know. How long you would be sentenced for, you wouldn't know." As Hilgers says in her book, Chinese people apply for and receive asylum more often than any other group of immigrants in the U.S. She says there are many reasons for that, including some that are political, like Zhuang's. "There's a lot of sympathy for Chinese people because the reasons that they apply with asylum have to do with forced abortions, the one-child policy which strikes quite a chord here," Hilgers says, referencing population-control measures that were eased in 2016. "Political trouble, which I think after Tiananmen Square also was very well-publicized here." But even though Zhuang and his family were granted asylum, he had difficulty adapting, as Little Yan was able to go out and get a job while he couldn't work. This went against a traditional Chinese idea and initially made him feel uncomfortable. "In America, it's very difficult for a man without skills to find a job," he says. "To solely rely on her to work, I didn't feel good either." But Hilgers says it's common for men and women to exchange roles when it comes to earning money for their family after immigrating. "I kind of understand this to be almost a trope of immigration," she says. "These sort of women that do backbreaking work, and support the family and are really practical. A lot of times, men will go out and work in restaurants outside of the city, women will stay here and work, so I think women really shape the community." Zhuang now has a job that keeps him busy: driving for Uber. Though he once measured success by the political impact he had, he now has a different definition. Now being successful for him is "to have my own stable life, for my family. We don't necessarily need to be rich," he says. But Zhuang still thinks about Wukan and the state of life there. "In Wukan, there is no democracy, rule of law, freedom, and equality. Wukan needs this and the whole China needs to have it," he says. "If China doesn't change its policies, Wukan will never truly have free rule of law, democracy and equal society, good village." Until that happens, Zhuang says he cannot say that he's succeeded politically. NPR's Hansi Lo Wang and WNYC's Richard Yeh provided translations for this piece. WNYC's Richard Yeh also contributed to voiceovers. Flushing, the neighborhood in Queens, N.Y., is home to the largest population of Chinese immigrants in any city outside Asia. One of those immigrants is Zhuang Liehong. He arrived in 2014 from a small village in southwestern China called Wukan. He's the central character of a new book called "Patriot Number One: American Dreams in Chinatown." I went up to Flushing to meet him. CHANG: Zhuang, when you first arrived here and you saw Flushing, what went through your mind when you were taking it all in? ZHUANG LIEHONG: (Through interpreter) Arriving in Flushing, it feels like a city in China. Other than the buildings and Chinese store signs, just look at the pedestrians on the streets. They're mainly Chinese people. CHANG: Was there anything surprising about Flushing when you first arrived? ZHUANG: (Through interpreter) Here in Flushing, there are signs for the Democratic Party on street corners. There are supporters with brochures. There are also Christian people doing outreach on the streets. All of this doesn't exist in China. It's not possible. CHANG: It's not possible. Zhuang would know. In 2014, he fled Wukan just as the Chinese government was cracking down on it. The people of Wukan were demonstrating against government officials for selling communal land to developers. People close to Zhuang were hauled away to prison. One friend died under police custody. He and his wife Little Yan devised a plan to sneak into the U.S. as part of a tour group. Once the tour group got to the U.S., the couple quietly broke away and hopped a flight to New York. Zhuang knew only one person in New York - Lauren Hilgers. She's a journalist who had visited Wukan village to report on the uprisings. And Hilgers is the author of the new book "Patriot Number One." LAUREN HILGERS: As soon as he got to my house, he was very intent on getting to Flushing and starting a life. And he had all of these goals. He wasn't going to stay in my house forever. CHANG: Turns out she was right. Zhuang has a place of his own now. He drove us there. He actually drives a lot. He's an Uber driver now. His home is tucked away on a suburban-looking street still in Flushing. There are manicured front lawns, leafy sidewalks, driveways. It's the very picture of middle class. CHANG: But in the basement beneath one of those homes there's a different story. ZHUANG: Yeah, kung fu tea. (Through interpreter) We have this traditional virtue of becoming friends through drinking tea. So whenever a friend arrives, you have to make tea for them. CHANG: So, Zhuang, you came to the U.S. more for political reasons rather than economic ones. Can you tell me, what did you hope to find when you came to the United States? ZHUANG: (Through interpreter) I wasn't hoping that the U.S. would give me some preferential treatment. I only wanted to escape the possibility of being persecuted in China. The pressure in Wukan was that at any moment you could be arrested. At any moment you could be convicted, grabbed and thrown into prison. CHANG: One of the most fascinating things I learned reading your book, Lauren, is that Chinese people apply for and get asylum more often than any other group of immigrants in the U.S. Why is that? HILGERS: There's a lot of sympathy for Chinese people because the reasons that they apply for asylum have to do with forced abortions; the one-child policy, which strikes quite a chord here; political trouble, which I think after Tiananmen Square also was very well-publicized here. CHANG: What I found so interesting in this book is that many of the men in Flushing were men who were in a way financially dependent on the women in their lives. I remember in the beginning, Zhuang, you found it very hard to see your wife go out and get her own job, especially at the nail salon. Why did you not want her to go out and work and have her own life? 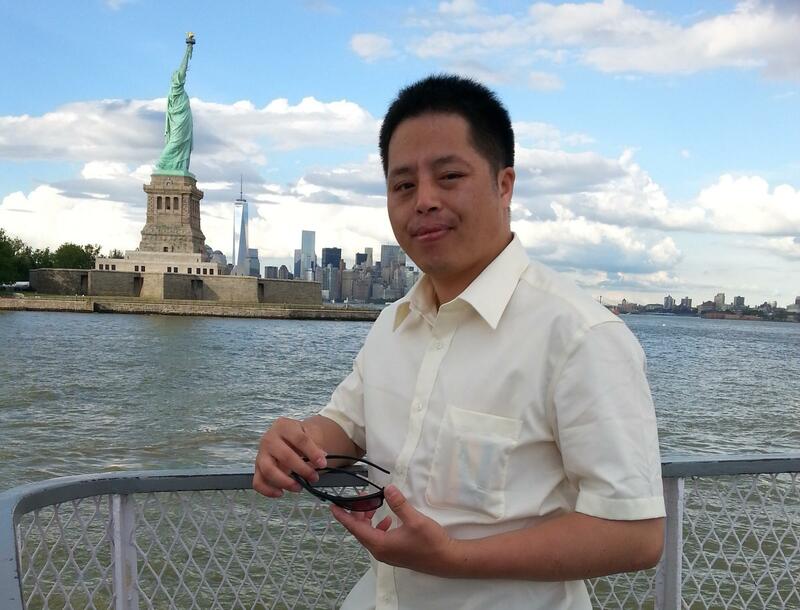 ZHUANG: (Through interpreter) That period of time in the beginning I couldn't work and couldn't have an income because here in America it's very difficult for a man without skills to find a job. To solely rely on her to work I didn't feel good either. CHANG: Why did it make you uncomfortable? ZHUANG: (Through interpreter) There's also this Chinese traditional idea. To let your wife go out and work you wouldn't feel good inside. And you do lose face. CHANG: What helped you get through that difficult time? ZHUANG: (Through interpreter) Nothing. No one helped. Here it's very difficult if you don't know English. Plus, women here can easily find jobs, but it's difficult for a man here. So Little Yan at the time often said I like to eat, but I'm too lazy for work. I used to be very angry at this because this really hurts my dignity. CHANG: Lauren, I'm curious. How common - in studying Chinese immigration, how common is it to see men and women exchange roles when it comes to earning money for the family? HILGERS: I kind of understand this to be almost a trope of immigration, these sort of women that do backbreaking work and support family and are really practical. A lot of times men will go out and work in restaurants outside of the city and women will stay here and work. So I think women really shape the community in a way. CHANG: Another thing I learned after reading your book is that Asian immigrants are the fastest-growing immigrant population in the U.S., far exceeding immigrants from Latin America. But it just feels like the political conversation in this country about immigration is not focused on Chinese immigrants. Why is that, you think? HILGERS: Well, I think the situation over a hundred years ago Chinese immigrants were considered villainous. And the first sort of exclusionary immigration act was focused on Chinese people. They were considered very lazy, a bad influence. They would attack our women. There are echoes of it now, just it's no longer Chinese people we're talking about. CHANG: Zhuang, back in Wukan you measured success by the political impact that you had. How do you measure success in your life now here in Flushing? ZHUANG: (Through interpreter) To have my own stable life for my family. We don't necessarily need to be rich. But in Wukan, there is no democracy, rule of law, freedom and equality. Wukan needs this, and the whole China needs to have it. If China doesn't change its policies, Wukan will never truly have free rule of law, democracy and equal society. It's impossible. So I cannot say that I've succeeded. CHANG: That was Zhuang Liehong, a Chinese dissident who lives in Flushing, Queens. He's the subject of Lauren Hilgers' new book "Patriot Number One: American Dreams in Chinatown."